Now keep your lips fresh through 200 bites, 120 sips, and countless kisses. Meet the 24-hour lip color that stretches the limits of long-wear. The 2 way lipstick includes a liquid lip color on one end and a lip balm on the other. Formula with Micro-Flex looks & feels fabulous throughout the day. Available in a collection of new amped-up shades. Long-lasting lip color keeps lips looking and feeling freshly applied. Gives you high coverage without bleeding. Flex formula keeps the Lipcolor gorgeous for up to 24 hours. Glides on and looks gorgeous all day. No crumbling, no caking, no fading, no feathering, no transferring. Additional Information : A world famous American cosmetic brand, Maybelline New York is known for its scientifically-advanced makeup formulas, revolutionary textures and up-to-the minute, trendsetting beautiful makeup products that are affordable and make you look effortless and stunning. With Maybelline, it's all about empowering women to make a statement and explore new looks each day! Explore the entire range of Liquid Lipstick available on Nykaa. 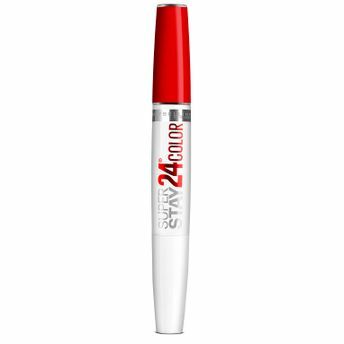 Shop more Maybelline New York products here.You can browse through the complete world of Maybelline New York Liquid Lipstick .Alternatively, you can also find many more products from the Maybelline New York Superstay 24 Color 2 Step Lipstick range.